Residents living near Castle Farm Recreation Centre in Kenilworth have raised concerns over inconsiderate parking when football matches have been on recently. Many vehicles have parked on double yellow lines and on grass verges near the centre, raising fears among residents that a serious accident could happen. This has not been helped by a backlog of football matches which were postponed due to the wintry weather earlier in the year. Richard Robinson, a nearby resident, felt the on-site parking cannot cope with high demand. And with Kenilworth Wardens set to move to the site in the future, he is worried the situation may only get worse. Richard said: "It's proving there's a lack of parking on-site when the place is fully utilised. "It was a couple of weeks ago when there were eight pitches being used - and there were cars all over the place parked really poorly. There were people parking on double yellow lines and off road. "There's a complete disregard for people living around there by people using Castle Farm." 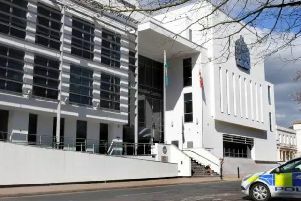 Town councillor Richard Dickson raised the issue with Warwick District Council. The district council has now contacted clubs who use Castle Farm's pitches, and has advised them to remind drivers about the need to park responsibly. But Mr Robinson was still worried accidents could happen. He added: "I've seen cars coming down John O'Gaunt Road doing 60mph. I've even seen cars speeding along these roads taking children to football. They are still driving way too fast down there." The upcoming Kenilworth Wardens move is part of Warwick district's Local Plan. The fine details of the move have yet to be agreed, but the Kenilworth Neighbourhood Plan will now only support the Wardens move if new traffic routes are backed up by a 'full traffic study' which will minimise disruption.